The city of Innsbruck with its 150,000 inhabitants is the provincial capital of the Austrian province of Tyrol. Situated in the Austrian Alps in the middle of Europe, Innsbruck will host the first Youth Olympic Games 2012 (YOG). 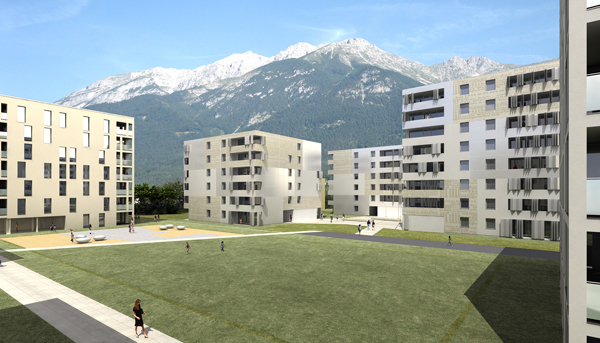 Constructed within the framework of the Youth Olympic Games to accommodate the participants and coaching staff, the Olympic Village in Innsbruck will be part of the Games even though it is not a sports venue. The Olympic Village will provide space for everything that happens in between competitions and training. It is a Space for people from different cultural backgrounds to meet and exchange ideas, but also a place for recreation, preparation and concentration, at best also a place of peace, where participants can find somewhere to relax in the midst of the hectic events around them. The same also applies to the subsequent inhabitants of the apartments who will use them once the Youth Olympics are over. Basically, their demands and needs as regards their living conditions do not differ from those of the athletes. The art project INTIMATE SPACE by the Austrian-based Brazilian artist GEORGIA CREIMER evolved from an Art&Construction competition advertised as part of the framework of this building project. It is one of five winning projects being realised in the Olympic Village. On the one hand, INTIMATE SPACE is concerned with the cultural diversity of the invited athletes and on the other hand with what they share as regards their private life and accommodation. In this process, Creimer looks at living in its original meaning: the German word "wohnen" (Engl. living) is rooted in the Old High German and means to be "satisfied", "to be", "to stay". INTIMATE SPACE takes up the meaning of the Olympic Village, not only for the athletes, but in particular for the subsequent, long-term inhabitants of these buildings. The scale of this international event is then contrasted with the intimacy of a view of particular and individual locations. 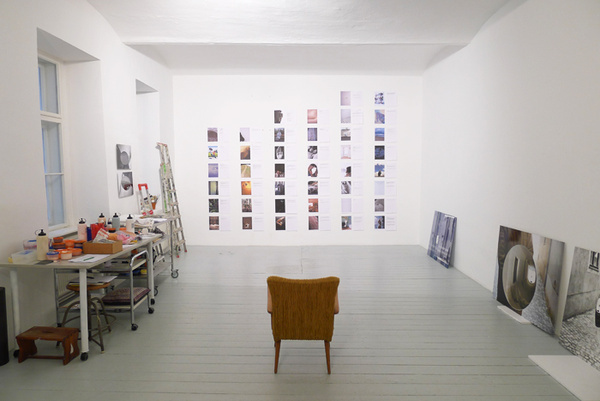 Art students from around the globe were invited to photograph their own "Intimate Space". That place where it is possible to relax, where they can reflect and find themselves. In addition they were asked to write a short text on the pictures that explains why the place is so special to them. The photographed location may be found within a building or in nature, it can be a piece of furniture or the roof of a house or whatever else the authors can relate with the above qualities. Yet in this context the place photographed should not only be understood as a physical or spatial location: thus a place of peace and concentration can also be something in a person's mind, something that he/she is inspired by and can trigger this state of mind. The text can describe what is depicted, but it should reveal something about the subject and the authors' relationship with it or simply tell a story that is connected with the image. 42 contributions were selected. The colours of the selected pictures in 180 x 240 cm format were digitally processed. 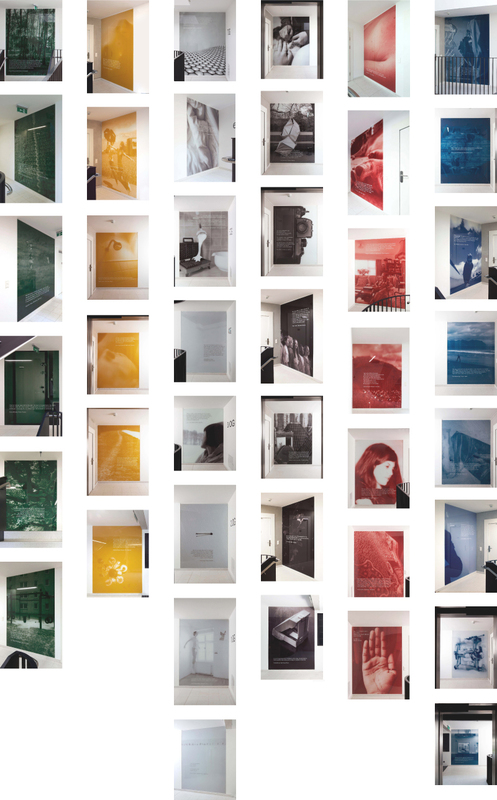 Together with the texts, the photographs were printed on floor-to-ceiling glass panels and are permanently installed in the 42 floors of six buildings in the Olympic Village designed by the Austrian architectural team din a4. The selected contributions can be seen in their original form HERE. Later on, a book on INTIMATE SPACE will document the project and will also show the unprocessed, original contributions. The most well-known symbol of the Olympic Games is the flag with the five interlinked rings in various colours on a white background. The six Olympic colours, white, red, blue, green, yellow and black were chosen because the flag of every country in the world contains at least one of these colours. The number of the rings stands for the five continents (classical counting method). INTIMATE SPACE uses several media, but primarily picture and text. In the digital processing of the selected photographs the colours first were removed from the original picture files and then new monochrome colour values were chosen. In this process, one of the colours of the Olympic flag is used for one picture (red, blue, green, yellow or black). The texts are always represented in the sixth colour (white). The texts are written in English and only spelling mistakes were corrected. So the various linguistic colourings should remain intact. The selection of the colours on the one hand references the values symbolised by the Olympic flag: "peaceful encounter and connection of various cultures". On the other hand, the colours are employed in the project to facilitate orientation and to create spatial identity within the residential neighbourhood. The exact selection of the walls reflects the architectural facilities and the residents' movement flows in the staircases. June 2011: Selection of 42 picture and text contributions; the selected contributions will be presented on this website in their original form. July 2011: Digital processing of the 42 selected picture contributions, text editing of the 42 print files. August 2011: Printing of the picture/text-subjects by digital printing on 42 glass plates (each 180 x 240 cm), publication of the selected contributions on this website. September 2011: Mounting of the glass panels on the walls of each floor of the staircases in the Olympic Village.